A posterior vitreous detachment (PVD) is a condition of the eye in which the vitreous membrane separates from the retina. It refers to the separation of the posterior hyaloid membrane from the retina anywhere posterior to the vitreous base (a 3–4 mm wide attachment to the ora serrata). As a posterior vitreous detachment proceeds, adherent vitreous membrane may pull on the retina. While there are no pain fibers in the retina, vitreous traction may stimulate the retina, with resultant flashes that can look like a perfect circle. If a retinal vessel is torn, the leakage of blood into the vitreous cavity is often perceived as a "shower" of floaters. Retinal vessels may tear in association with a retinal tear, or occasionally without the retina being torn. 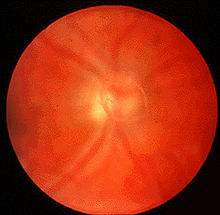 A Weiss ring can sometimes be seen with ophthalmoscopy as very strong indicator that vitreous detachment has occurred. This ring can remain free-floating for years after detachment. The risk of retinal detachment is greatest in the first 6 weeks following a vitreous detachment, but can occur over 3 months after the event. The risk of retinal tears and detachment associated with vitreous detachment is higher in patients with myopic retinal degeneration, lattice degeneration, and a familial or personal history of previous retinal tears/detachment. The vitreous (Latin for "glassy") humor is a gel which fills the eye behind the lens. Between it and the retina is the vitreous membrane. With age the vitreous humor changes, shrinking and developing pockets of liquefaction, similar to the way a gelatin dessert shrinks and detaches from the edge of a pan. At some stage the vitreous membrane may peel away from the retina. This is usually a sudden event, but it may also occur slowly over months. Age and refractive error play a role in determining the onset of PVD in a healthy person. PVD is rare in emmetropic people under the age of 40 years, and increases with age to 86% in the 90s. Several studies have found a broad range of incidence of PVD, from 20% of autopsy cases to 57% in a more elderly population of patients (average age was 83.4 years). People with myopia (nearsightedness) greater than 6 diopters are at higher risk of PVD at all ages. Posterior vitreous detachment does not directly threaten vision. Even so, it is of increasing interest because the interaction between the vitreous body and the retina might play a decisive role in the development of major pathologic vitreoretinal conditions, such as epiretinal membrane. PVD may also occur in cases of cataract surgery, within weeks or months of the surgery. The vitreous membrane is more firmly attached to the retina anteriorly, at a structure called the vitreous base. The membrane does not normally detach from the vitreous base, although it can be detached with extreme trauma. However, the vitreous base may have an irregular posterior edge. When the edge is irregular, the forces of the vitreous membrane peeling off the retina can become concentrated at small posterior extensions of the vitreous base. Similarly, in some people with retinal lesions such as lattice retinal degeneration or chorio-retinal scars, the vitreous membrane may be abnormally adherent to the retina. If enough traction occurs the retina may tear at these points. If there are only small point tears, these can allow glial cells to enter the vitreous humor and proliferate to create a thin epiretinal membrane that distorts vision. In more severe cases, vitreous fluid may seep under the tear, separating the retina from the back of the eye, creating a retinal detachment. Trauma can be any form from a blunt force trauma to the face such as a boxer's punch or even in some cases has been known to be from extremely vigorous coughing or blowing of the nose. Posterior Vitreous Detachment is diagnosed via dilated eye examination. For some patients the vitreous gel is extremely clear and so it can be hard to see the PVD. In these cases, additional imaging such as Optical Coherence Tomography (OCT) or ocular ultrasound are used. Therapy is not required or indicated in posterior vitreous detachment, unless there are associated retinal tears, which need to be repaired. In absence of retinal tears, the usual progress is that the vitreous humor will continue to age and liquefy and floaters will usually become less and less noticeable, and eventually most symptoms will completely disappear. Prompt examination of patients experiencing vitreous humor floaters combined with expeditious treatment of any retinal tears has been suggested as the most effective means of preventing certain types of retinal detachments. ^ Gauger E; Chin EK; Sohn EH (17 November 2014). "Vitreous Syneresis: An Impending Posterior Vitreous Detachment (PVD)". University of Iowa Health Care: Ophthalmology and Visual Sciences; See "Discussion" following "Clinical Course". ^ Yonemoto, J; Noda, Y; Masuhara, N; Ohno, S (June 1996). "Age of onset of posterior vitreous detachment". Current Opinion in Ophthalmology. 7 (3): 73–6. doi:10.1097/00055735-199606000-00012. PMID 10163464. ^ "Posterior vitreous detachment". rnib.org.uk. 2014-02-19. Retrieved 3 November 2015. ^ Acta Ophthalmol. 2012 May;90(3):e179-84. doi: 10.1111/j.1755-3768.2011.02310.x. Epub 2011 Nov 22.Prevalence of early and late stages of physiologic PVD in emmetropic elderly population. Schwab C, Ivastinovic D, Borkenstein A, Lackner EM, Wedrich A, Velikay-Parel M.
^ Hilford D; Hilford M; Mathew A; Polkinghorne PJ (2009). "Posterior vitreous detachment following cataract surgery". Eye. 23 (6): 1388–1392. doi:10.1038/eye.2008.273. PMID 18776863. ^ Byer, NE (September 1994). "Natural history of posterior vitreous detachment with early management as the premier line of defense against retinal detachment". Ophthalmology. 101 (9): 1503–13, discussion 1513–4. doi:10.1016/s0161-6420(94)31141-9. PMID 8090453.